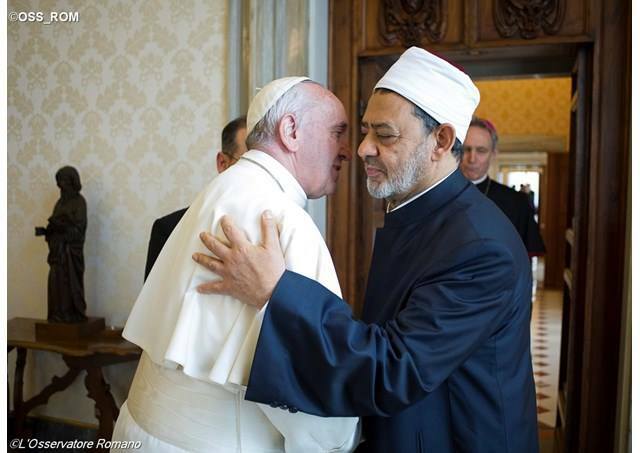 Pope Francis met the Grand Imam of Cairo’s Al-Azhar, Ahmed al Tayyeb, at the Vatican, marking a first of such an encounter between a Pope and the Imam of Al-Azhar, who many Muslims consider to be the highest authority in Sunni Islam. Upon his arrival in the Vatican, the Grand Imam was welcomed, and then accompanied to his audience with the Pope, by the President of the Pontifical Council for Interreligious Dialogue, Cardinal Jean-Louis Tauran, and by the Secretary of the same dicastery, Bishop Miguel Ángel Ayuso Guixot. Those in the Imam’s delegation included: Dr. Abbas Shouman, Undersecretary of Al-Azhar; Dr. Mahmaoud Hamdi Zakzouk, member of the Council of Senior Scholars of Al-Azhar University and Director of the Center for Dialogue of Al-Azhar; Judge Mohamed Mahmoud Abdel Salam, Advisor to the Great Imam; Dr. Mohie Afifi Afifi Ahmed, secretary-general of the Islamic Research Academy; Ambassador Mahmoud Abdel Gawad, Diplomatic Advisor to the Grand Imam; Tamer Tawfik, Advisor; and Ahmad Alshourbagy, Second Secretary. The delegation was accompanied by Ambassador of the Arab Republic of Egypt to the Holy See, Hatem Seif Elnasr. During the meeting, Pope Francis gave the Grand Imam the medallion of the olive tree of peace and a copy of his Encyclical Letter on the environment ‘Laudato si‘. After meeting with the Pope, the Grand Imam and his delegation met briefly with Cardinal Tauran and Bishop Guixot Ayuso. There has been speculation this official visit would take place since February after a Vatican delegation visited Al-Azhar university and expressed the Holy See’s willingness to welcome the Grand Imam for a meeting with Pope Francis.